3: It has less than 300 calories per serving – including the rice! This Szechuan Orange Chicken turned out amazing – just mix up a quick sauce using fresh ginger, garlic, orange juice, soy sauce, and sesame oil, and you’ll never be tempted to spend those extra calories on take-out again. Load up your dish with some broccoli and carrots, and you can feel good about eating it, too. I love healthy meals that don’t taste healthy, don’t you? Let’s talk about the rice for a minute, okay? I’m like most of you – I have a super busy weeknight schedule, and very little time to get healthy dinners on the table. That’s why I love using Minute Rice. Seriously, I use Minute brown rice at least once a week. It has the same nutritional values as regular long cooking brown rice, but it is ready in just 10 minutes – just one-quarter of the time of regular brown rice. It’s my go-to side dish for weeknight meals, and I always keep a box on hand in my pantry. Did you know both Minute Brown and Minute White are also gluten free? While my chicken and veggies were sautéing, I quickly boiled up some water and cooked my rice. In less than half an hour, I had a tasty, healthy dinner on the table for my family. Who needs take-out when you can eat like this? While your rice is cooking, combine chicken, orange zest, 1 tablespoon cornstarch and 1 tablespoon soy-sauce in a large bowl. Toss to coat. In a small bowl, combine orange juice, chicken broth, honey, sesame oil, pepper flakes, the remaining 2 teaspoons cornstarch, and remaining soy sauce. Set aside. Heat 1 tablespoon canola oil over medium-high heat in a large skillet. Add chicken mixture and stir fry until lightly browned on all sides, about 5 minutes. Transfer chicken to a plate and tent with foil to keep warm. Return skillet to heat and add remaining 1 teaspoon canola oil. Add ginger and garlic, and fry until fragrant, about 15 seconds. Add broccoli and carrots and cook until broccoli is bright green, about 2 minutes longer. Pour in your reserved orange juice mixture and bring to a boil. Cook until thickened - about 1 minute. Add chicken and cook until heated through. This is a sponsored post written by me on behalf of Minute® Rice. All opinions are my own. 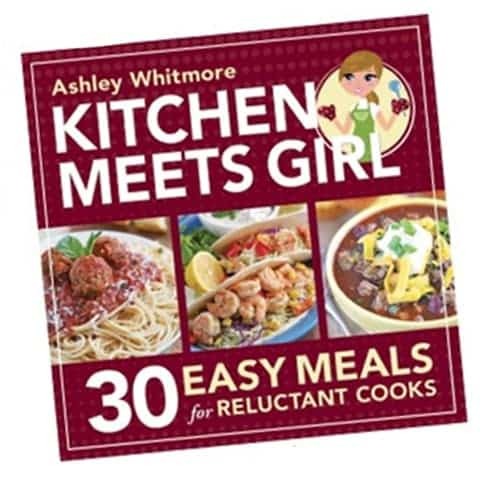 Ashley, I’m all over this! Orange chicken is the one thing Jordan WILL eat! SCORE another time. Easy… healthy….plus looks so yummmmy. You are my hero today! Haha! You definitely need to make this, though. It’s awesome! Everyone in my house loved this recipe – including my picky kiddo! I’m always looking for ways to make great “take-out” type foods at home…and this recipe is a definite keeper. We order take out Chinese atleast once a month. I always feel like a fatty after eating it. This is an amazing alternative! I’ll be making this for sure!! And can I tell you a secret — no matter how great of a cook I am, 95% of the time when I make rice, it doesn’t turn out. THANK GOODNESS for microwave rice! It saves me all the time! I hear you – I have a tendency to walk away from my rice and end up with a gummy/stuck on the bottom of the pan mess! And while I LOVE take-out Chinese, the place we usually order from literally has grease coating the floors and tables. So good, but so very, very bad. YUM! 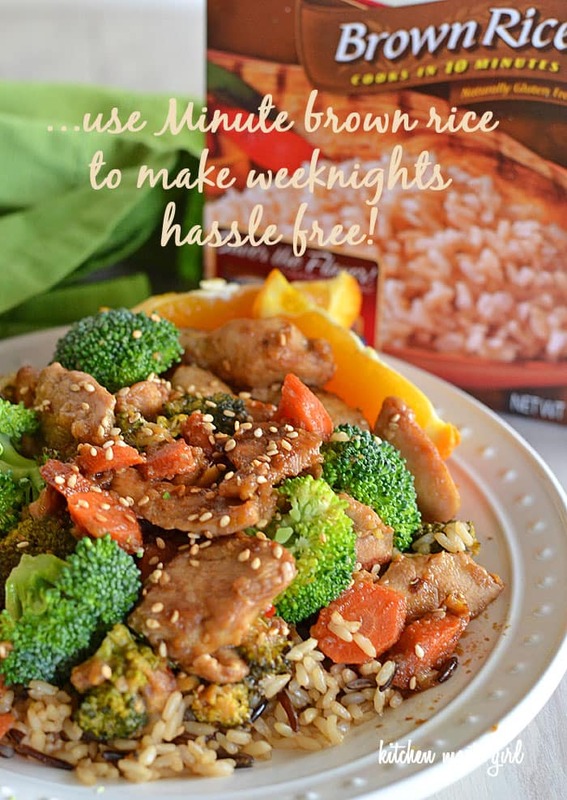 This sounds delicious and I love how quick it is to make – perfect for a weeknight meal! 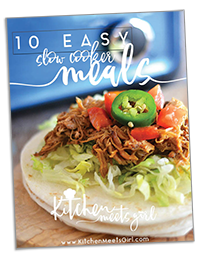 I’m all about quick weeknight meals, that’s for sure! I was surprised how flavorful this was with so few ingredients. We loved it! My husband loves orange chicken! It’s so nice to have meals like this for during the week when life is crazy. This looks delicious! Thanks, Ashley! 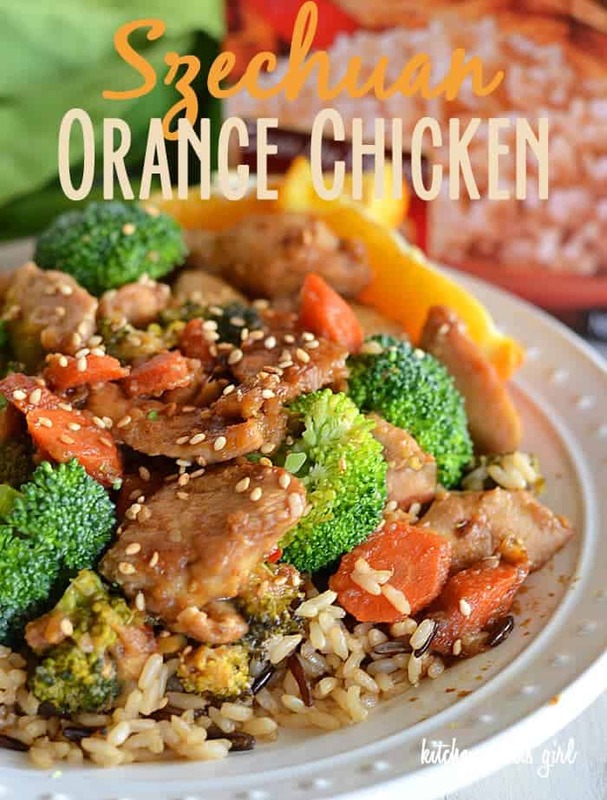 My husband loves orange chicken also, and he’s already asked me to make this recipe again. It was so good! This dish defiantly beats takeout any day! And minute rice is also my go to on week nights. Or I use frozen rice from Trader Joes. Who has time to stand over a stove for an hour? Hi Ashley, just letting you know that your link to Food on Friday: Chillies and Other Spicy Stuff was featured in my Need Some Inspiration? Series today. Have a nice week. Wow! Thanks so much, and thanks for stopping by! 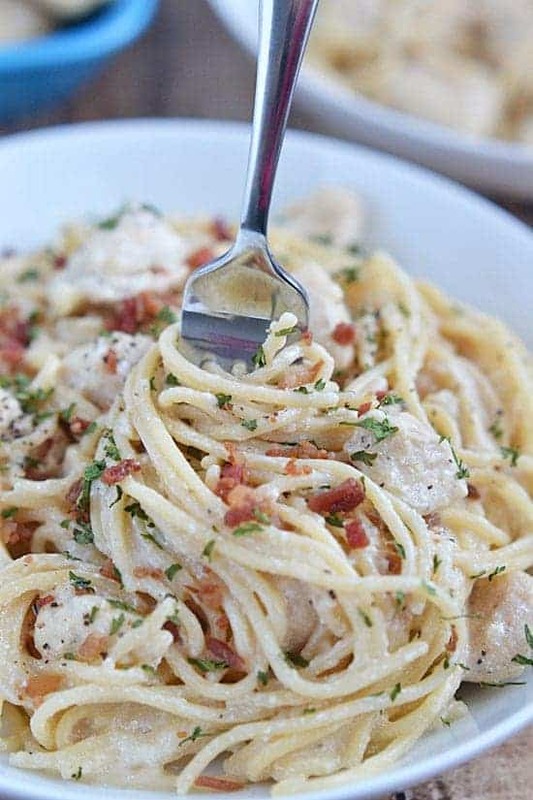 Okay, you’re my official go-to dinner guru. 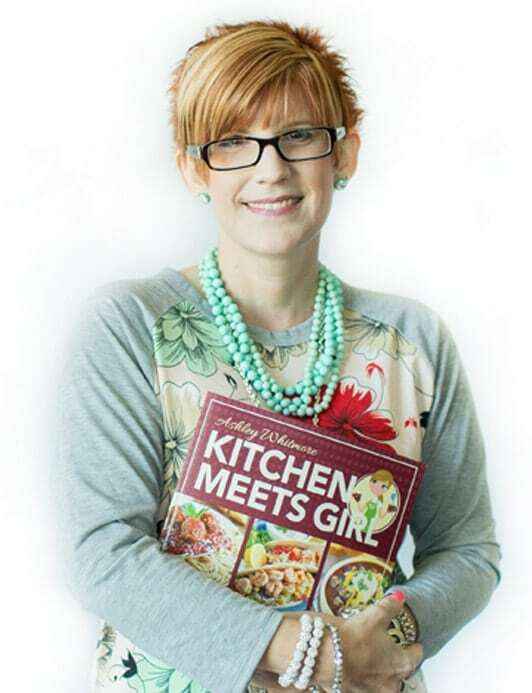 I am making SO many recipes of yours next week and I can’t wait! This is now one of them. My family LOVES takeout, and orange chicken is a fave. Hello, who doesn’t drool over it? I can’t wait to eat this! Made this tonight. Forgot the chicken broth, so didn’t use that, but it’s really good. Thanks for sharing. You saved me from a million calories at Panda Express. Oh good, I was just going to ask if this could still taste as yummy if I didn’t have any broth on hand, and just used water. Would that work…or did you just leave it out altogether not even subbing water? Thanks to anyone for their input! This looks delicious. We love Asian food but hate take-out. So I’m putting this on our menu for next week. Yum ~ I can hardly wait. This had to be the very worst recipe i have made..Now I am a fairly good cook..certainly not inexperienced. But I threw mine back in the pan and had cereal and toast. Husband ate it because they was nothing else to eat..Too hot for my taste..it just goes on and on..Too bad as there is a bit of prep to make it..Will be using the delete tab on this one.. So sorry this wasn’t suited to your tastes. Thanks for letting me know! I know you have calories.. but did you calculate the points on it??? design to lace you online store with right set of functions and features. Wow, this looks basically exactly like Szechuan Orange Chicken recipe in the Weight Watchers Tastier Than Takeout cookbook!